Buy Kevin Williams / Survival Skills a Coffee. ko-fi.com/survivalskills - Ko-fi ❤️ Where creators get paid by fans, with a 'Buy Me a Coffee' button. Motorcyclist, biker, rider... whatever! Most of my working life has involved motorcycles and riding them. Eider coach, writer & author, motorcycle safety advocate. Since 2011, my time has been given freely to the nationwide Biker Down scheme run by many of the UK's fire services. I created the 'Science Of Being Seen' (SOBS) presentation for Kent FRS, and deliver it once a month in Kent. Researched & authored the 'Lucky 13' cartoon series for the European Motorcycle Manufacturers Association (ACEM), worked on projects including 'Be a Better Biker' in Buckinghamshire, the Rider Skills project in Somerset. Keynote speaker delivering SOBS to audiences in New Zealand on the 'Shiny Side Up' rider safety initiative in 2018 & 2019, all across the country. Thanks for visiting. If you enjoy the Survival Skills content, please consider supporting what I do. Coffee is much appreciated! Here's how: (1) Just click the big red 'SUPPORT SURVIVAL SKILLS' button and you'll help keep the articles coming. (2) Make sure you become a follower and look out for FREE DOWNLOADS that will ONLY be available here on Ko-fi. Secured Payments. Support goes to Kevin Williams / Survival Skills's account. 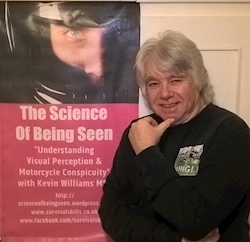 Would you like to help me with the development and hosting costs for the 'Science Of Being Seen' website for 2019? SOBS is provided absolutely free to help all motorcyclists and safety experts to better understand collisions between drivers and riders. The initial research and set-up has been funded from my own pocket but if you'd like to help all donations would be gratefully received and will help fund my time on this vital project. Upgrade Kevin Williams / Survival Skills to a yearly Gold Membership with a one-time payment.